You and your shadow friend. So... Shadow Puppeteer. Pretty good PC co-op game, right? I mean, we certainly thought so when we wrote our Shadow Puppeteer Co-Op Review back in 2014. The artsy puzzle platformer has been quietly evolving since then, growing support for a touch screen gamepad and finally releasing on Wii U, local co-op intact! Shadow Puppeteer was made for cooperative gameplay. 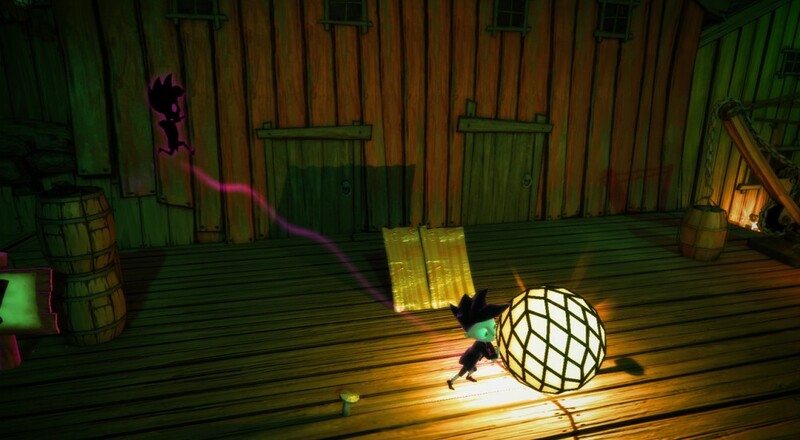 Two players control the boy and his shadow at the same time, each existing in their own version of the same world. Solid sapiens have a hard time crossing big gaps, but if a shadow is cast at just the right angle, the boy's shadow can jump across no problem. And if the shadow's not at the right angle, slide a light source so it is! Moving platforms and dealing with dangers all play into that double 2D/3D dynamic, forcing you to work with your shady buddy to make it through the dark village. The Wii U version of Shadow Puppeteer features controls optimized for the Wii U gamepad. Single player is possible by switching between the boy and his shadow, but as we noted in our review, this really defeats the purpose of Shadow Puppeteer. Fortunately, gameplay is easy enough to pick up and is suitable for gamers of all experience levels, even those little things people call kids!